Vienna is known for its’ charm, imperial sights, cultural events, coffee houses, cosy wine taverns, and of course, the world famous Sacher Torte. It is not known for many awkward and unusual facts. Another difference between the USA and Europe. The reason I included this on my unusual facts is that automatic cars are extremely rare here.Tell someone you can’t drive a stick shift (like me) and their eyes pop wide open as if you told them you just recently landed from Mars with your 19 kids in tow. Being a Donut connoisseur, I can tell you that the doughnuts were not the same as other Dunkin’ Donuts I had tasted. Needless to say, the hype didn’t last long and the branch here in Vienna gone completely broke. What did you think about these awkward and unusual facts? Did you know any or all of them? You might be glad to know that Dublin Donuts is back in Vienna! There is one that I know of in Donau Zentrum. They have “donuts” but they don’t exactly taste the same as in the US. Dublin Donuts? Is that new? We had Dunkin; Donuts here once but never Dublin. Thanks for the tip. xoxo S.
This is excellent and I’ve been planning a trip for a while. Hopefully this year for the Christmas markets. I love beer and my girlfriend loves dogs – great news for both of us! Great advice about damaged shoes! I remember needing that same advice for when I lived in Florence and just broke a ton of shoes. And the drinking age all around the world is pretty low and I much prefer it that way because then kids don’t abuse it and learn their limits early on. Haha and I much prefer bagging my own groceries even though its not usually the practice, just because it makes the line go faster for people behind me! I love reading about unusual habits and facts about a country! I can’t believe the drinking age is 16 – that’s way too young!! As for donuts, it reminds me of the time my friend from Italy came to Canada with her husband. She was excited to introduce him to donuts (she was born in Canada) but he didn’t enjoy them at all and couldn’t categorize them either! I like how you gathered fun and also interesting facts about Vienna. Yes usually in Europe you can drink from 18 legally and yes beer and wine are quite acceptable from 16 haha. I also like how you arranged your blog, keep up the good work :). No donuts threw me off my seat and flying down a chasm of depression! Vienna being such a beautiful picturesque place to visit, has such unusual facts and some are very amusing as well. Thanks for sharing them, it was a wonderful read. Wow! Those are truly interesting. That’s why we love traveling; things are never what you expect them to be. We would love to visit Vienna when we have the chance. Hi there I just read your post. And being a real viennese I can tell you that most of the things are correct. Exept the thing with school education: there has to be formal training till the age of 16- but most of the pupils stay longer. And we don’t need aircondition because we life in old houses with thick walls – you need a very hot summer to heat them. I guess to you I am not a “real Viennese”? Hahahahahaha! Your sentence about the school system is no longer accurate. That might have been true when you were in school but that is no longer the case. You can verify this information from the Stadtschulrat ( Vienna Municipal Education Authority). I ensure the information I post on my website is accurate and up to date. Also, not all houses have thick walls either. In fact, quite the contrary, there are lots of houses which do not have thick walls and people choose not to spend the money to have the walls broken down and redone – especially if they are just renters. I love this! Really cute and very interesting! How fun to learn so many quirky facts about Vienna…all of them making me want to visit the country much more than I did before I read this post! I really enjoy these kinds of posts. I’m wondering, do many kids actually choose to stop school and start working at 14? Never heard about those things before. I think I am going to enjoy Vienna. I was shocked also that young people are already allowed to have those drinks and to decide on such a young age. For us, it is really a young age to decide. I am an aussie and you certainly mentioned quite a few things that are different from here too. Wow kids only need to go to school until 14 – that is certainly different – here the average age is 17 years of age. 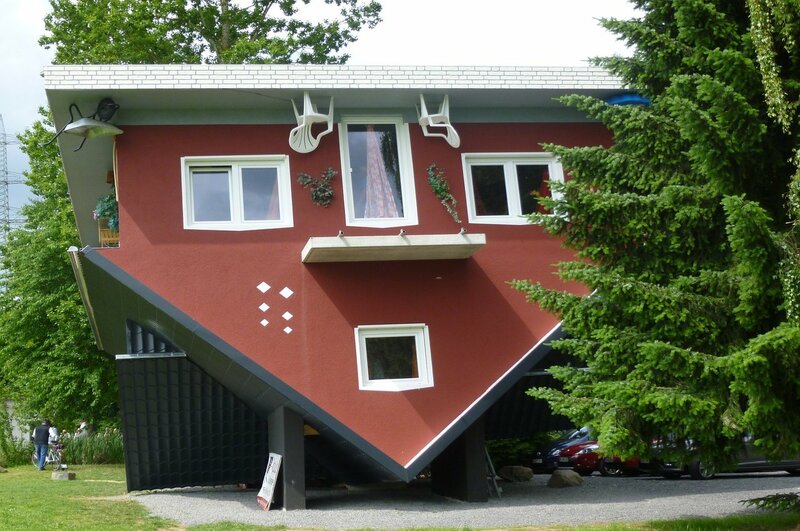 And what’s with that quirky house – that looks cool. #7, the legal age in Canada is 18 as well. But I have to agree with your friend, American beer does taste like – I don’t even need to try the good stuff to know that lol. 14 is definitely too young to make those choices – I think Germany has a similar system – Canada makes you pick from College level, University level and Applied level (not doing anything after high school) and they can’t easily switch once they have started the program. I’ve never been to Vienna and I would want to visit it one day. Thank you for sharing all these information. I am in-love with cities that were able to preserve old cobblestone streets. Oh and yes, in Denmark, you bag your own groceries too but they have dividers so the items of the person behind you will not mix your paid items upon checkout. I absolutely love ballet flats! So glad to know some of the history behind the footwear that I love so much. Vienna seems like a beautiful place, too. The fact that kids only go to school until they are 14 is quite interesting. We would never be able to get away with something like that in the United States for sure. Houses older than Pyramids!? What!? This is something very interesting. I want to do more research about this now. Thanks for this informative post! I find it so funny that people read that line in the post and miss the part that says it is just an exaggeration,but as it is now seen in the comments, everyone is thinking that there are really houses here older than Pyramids in Vienna, hilarious! Hahahahaha. Alright, First question.. What is the deal with that building that’s upside down in the first pic?? That actually set the tone for the “unusual” facts about Vienna. Hard to imagine a life without donuts though 😀 Not very often you get to hear that Dunkin Donuts went broke!! Love this list but the whole donut thing made me sad. When we lived in Germany, we visited Austria several times. My daughter took ski trip there with her Girl Scout Troop and we visited Eagle’s Nest. I was most surprised that at 14 kids are considered old enough to make a decision about their educational future. I wish we could be a one car family like the ones in Vienna. Our insurance and payment is ridiculous. Thanks for sharing some great insights on Vienna! My brother lived there for 2 years and he was very much fond of the city and its culture! He also told me about the grocery bag. I’d definitely love to visit Austria someday in my life! Hope you get to visit Ana! If you do, let’s have some coffee and cake! Wow! Vienna is so different from the US! I don’t know if I could make it without donuts or air conditioning, though. When I stopped through Vienna a few years ago it did strike me as odd that few women were wearing heels, but the reason totally makes sense. Vienna is a fantastic city though, doughnuts or no doughnuts (sob)! It was great reading about these unsual facts. As a dog lover i am so happy for the dogs living here. But also Im a bit surprised that individuals must choose to study or not at 14 years. I mean in my country people above thirty also opt for additional academics courses . There is no age for learning. Maybe this is one fact that I wouldnt want my child to choose from. Now that is an interesting read – old houses, legal age to drink at 16 and the cobblestone roads…Vienna is an interesting place to stay and visit. Very well compiled. The drinking age thing is quite common throughout Europe, and I think most of the world. One thing I like about being outside the USA (where I live) is people are not so hung up on alcohol. I’ve also seen the bag-your-own-groceries thing in much of Europe. Very interesting facts ! Seriously no donuts but am sure there are amazing pasteries.Love that everyone wears flats as I hate heels! Hi Polly, I was actually not surprised that I had to bag my own groceries as I am so used to it already, been doing it all my life here. I just thought it was great that in the USA, or when I holiday in Africa, that I don’t have to do it myself. My friend almost sprained an ankle on the cobblestones! Definitely go with non high heels. I also can’t believe DD tried to test the market and failed! 14?!?! That’s sorta insane!!! I can see so many kids choosing to dropout and regretting it a few years later!!! I loved Vienna! I also love that they are dog-friendly! Houses older than the pyramids? Wow! that is ancient! Thank you for sharing this angle on an incredible city! Sheri, here in Ukraine we only got our first Donuts a year ago lol! And they are sold in a few supermarkets around the country. And we were doing perfectly fine without them. And I honestly don’t see why anyone would want donuts in Vienna, when you have so many desserts there. Yumm! So many interesting facts here. I have visited Vienna but hadn’t hear about most of these. I did learn about #1 the hard way. I was in Vienna for a conference and my heels kept getting stuck between the cobble stones. The only option was to walk very slowly and carefully as it was so hot I didn’t want to take my shoes off and have my feet burn. Learned my lesson though. When I go back I will definitely not be bringing any heels. Awesome trivia on Vienna! Visiting this place has always been on my bucket list. With your post I am all the more inclined to make that happen soon! Thanks for sharing! Ha ha well told. I had been there for 3 days… yes the packing your own bag did surprise me. I had to hurry. I was not aware of kids being out of school at 14. That is too early. Wow this is impressive. I didn’t know any of this. I don’t know if I could do the no air conditioning. No donuts I can live with. I’m sure I would find a good replacement treat! Lol! This was so fascinating to read. I never knew any of these, I will now keep these in mind for a visit haha. I have always wanted to travel to Austria. I knew that they had to most livable city. It seems so cute and quaint compared to some of our big cities. I also knew about the money aspect, not having change. These are really cool facts. They need to get some really good donuts over there! How interesting! My parents are in Austria right now, and I’ll have to send this over to them! I’ve never been but hope to one day go. I hope they are having a great time Jessica. There is so much to do and see here. If they need tips on where to go, let me know or send them these links which has some more info on Austria:Discover Vienna and Austria. This post is so fascinating to me as I had not idea about these things! I’ve always wanted to visit Vienna though as a lover of classical music. Thank you for the list! Car sharing seems cool but a hassle for me. I already got used to having a car to use whenever I need one. Lmao. This was interesting! I only spent a day in Vienna but didn’t learn any of these. I agree that 16 is far too young!!! I have a plethora of ballet flats! I need to go visit and bring my collection. It looks like a great city for couples to visit. What interesting facts! I would love to visit one day, it all sounds wonderful as a visitor. Except the lack of air conditioning. The fact that dogs are welcome most places warms my heart, we love to take our yorkie with us! The big decision about your career choices at 14 is scary. In the US 5th graders are already expected to make these sorts of decisions, but at least they are required to stay in school longer! Your Yorkie would have so much fun here. There are even dog hotels where the dogs stay alone and have their own “room”, or there are some hotels which allow you to bring your pet and can watch them if you go out for drinks or to the Theater. I think you would love Vienna too 🙂 5th Grade is really early to make those kinds of decisions. That’s too much weight to place on a child’s shoulders. I definitely could not only do one car. There isn’t any public transportation where I live — my husband and I couldn’t both get to work! WOW, That’s so different for me Taylor Anne, I hardly ever drive anywhere. LOL. I much prefer public transportation. It is clean, fast, reliable and they are very punctual. I loved reading this. It is so fun learning interesting things about far away places. But seriously, no doughnuts??! Ha! Woah? What I thought that doughnuts existed across the world, how strange that it does not have doughnuts. Plus the drinking age is so young! Yes Austrian cakes are awesome and also a reason I will never be thin! 🙂 You are right most of these are more common in Europe, a different lifestyle to the USA. In Africa for example, lots of these laws don’t exist and parents just make judgments on what is best for their kids according to their maturity and responsibility level. What a great list. I always wear flats or sneakers when traveling. Vienna is on my bucket list. I’m always fascinated to learn about other cultures. It’s so interesting to how different life is in other parts of the world, like only having one car per family and being able to drink at a young age. Being a former teacher the school item caught my attention. It is hard to. Elise that kids decide their future at that age. I wonder how successful it is? It’s so nice to know these amazing 10 unusual facts. Few them are sounds weird but I think it’s a part of culture in that place. I would love to go there one day. I didn’t know this much about Vienna! There’s so much that you can learn. Also, WHY don’t you guys have donuts, that’s crazy! They make the world a better place to live in, really. These are some interesting things about Vienna. I would love to visit it someday to see the historical sites. I love reading these facts! I didn’t realize how young the drinking age was 16! Wow! I learned so much! I think I would love Vienna. I prefer stick shift cars – and they are hard to find in the US! Most of the grocery stores in my city here in Wisconsin have you not only bag our own groceries – but we check them out too! What an interesting list of facts. I love learning. OK I’m officially in love with this place now. I get to bring my dogs with me. How fun. I love it. It’s true in America there are way too many cars and not enough places to take our animals. I’d love to visit there! I haven’t thought about it much, but it sounds like fun. I’ll remember to wear flats. I wish mas transit was more available in the US I think it would be so wonderful to walk places. Don’t get me wrong I love my car but the slowed down pace of other countries sounds amazing. That is crazy that the drinking age there is so young. I did not know that. Many cool facts about a place I’d love to visit soon. No Doughnuts!? What a travesty! (Honestly, the sweet treat is sometimes necessary). But I love how you chronicled the differences- so many things I didn’t know about Vienna! I don’t think I knew ANY of these facts, but they sure made me laugh. I crave donuts all the time, but we don’t really have any where I live in West Africa either. When I go home, it’s one of my first snacks to eat! Hi Ivannar, where in West Africa do you live? I have lived in Ghana and Nigeria and no “real doughnuts” there, but some places offer some nice doughnut-like pastries. It’s 18 to drink here in the UK, so age 16 doesn’t really surprise me, or even both me to be honest. I really want to visit Vienna, such an interesting country. These facts are very interesting. This is an awesome list! My husband has visited Vienna and told me about it, but it was great reading your post too! He especially mentioned the cobblestone streets everywhere! Very interesting list, it’s funny comparing all the differences when you experience living in a another country. I don’t like driving auto’s I’m a manual driver all the way! I actually found when I was looking for a car a couple of years ago, that it was really hard to find manual’s as well, however I’m in Australia. This was so interesting! I did not know you could drop out of school at 14. My son is 14 and I can’t imagine him NOT going to school. Crazy about the legal drinking age too. 16? I agree with 18 though but 16 would be too young for me. I think 16 is way to young, kids are still maturing and often cannot assess situations properly when sober, let alone when they are drunk! Houses older than pyramids!! Now that’s a fact I missed on Vienna. BTW, you from Vienna? Now I feel a little sheepish about my Vienna post. Loved your city BTW. The coffee is so much more superior to what we have here in the USA. No kidding! I tell you Paighton, it’s a tough life over here…. I have a cousin who is from Vienna and she always told me how its such a beautiful place. I have not visited but I am going to Europe this December! Sounds like a pretty amazing place to me. I’m especially fond of the fact that dogs are so welcome. I live in a very dog friendly US city and that means a lot to me. Julie – Dog friendly cities are the best. I don’t think dogs necessarily need to be in restaurants (some love to beg for food from other tables, LOL) but aside from that, I welcome them. Ohh very interesting list! But NO. 6 really catch my attention.. an in my opinion it makes sense. Kids shouldn’t be carrying very hard load and just enjoy being kids, but it is not bad to teach them to learn to be responsible. I like the concept. No doughnuts!? That’s absolutely horrible! There are some things that are definitely different from the USA. I do like hearing they loved their dogs though!